Hello and thank you for your interest in my Professional Dog Trainers Program! During my program I teach all students how they can start their word of mouth advertising campaign through friends, family members, their veterinarian and local pet shops. Most graduates are booking clients before they complete my 12 week program. Brittany and Cassandra, two sisters from Ontario were in my fall 2004 program. Halfway through their course, their mother had already lined up over 30 clients for them! Many grads recoup the cost of my program within 3 months of starting their business. An average wage for grads from my program is $35 – $40 an hour. Since graduating from Ben Kersen’s Professional Dog Trainers Program, I have started a thriving business doing what I love. Business has gone so well, that I have had to hire in my first year. The information provided, hands on experience, and guest speakers opened my eyes and helped shape my future in the dog training industry. I would like to thank Ben and his knowledgeable staff for giving me the stepping stones for where I am today. My Professional Dog Trainers Program gives all students complete coverage of the business side of the industry, such as sales, marketing and advertising. Grads from my program have all the skills and information necessary to jump start their own business. There is no need for a high-end retail location or expensive equipment. All you would need to get started is a handful of well-designed business cards. Plan on meeting clients in high traffic areas such as the local dog park. Wear your company shirt, place a sandwich board sign beside you and start training your own trick and frisbee dog or a client’s dog. Dog owners will soon be flocking to you for bookings when they see how much fun the dog is having and how fast the training is progressing. 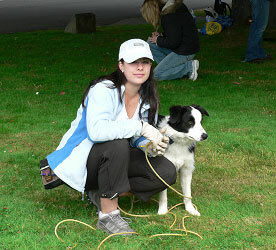 This is how I started my dog training business almost three decades ago and I haven’t looked back! Your future career choice is one of the most important decisions you will ever make. Dogs are in hospitals and seniors centers all over the world. They are “good therapy,” making people laugh and enjoy life! Can you imagine being paid to train dogs professionally while enjoying a healthy and profitable career choice that you are passionate about?! To read more click here. Again, thank you for your interest in my Professional Dog Trainers Program! I look forward to hearing from you. If you haven’t already, be sure to check out the video clips.